A new highly efficient and cost-effective technique to heat water in residential structures has been developed by a team of scientists from the University of Florida and the Department of Energy’s Oak Ridge National Laboratory. The technique, called the “semi-open” natural gas-fired design, tweaks and even eliminates some of the components of the conventional closed gas-fired systems. The details of the technique are explained in the ORNL-led article reported in Renewable Energy: An International Journal. When applied, the new concept could result in better than 100 percent energy efficiency, because the system draws energy from the surrounding air as well as from the natural gas. Dehumidification and water heating functions that are usually found in different devices are combined in the versatile model. 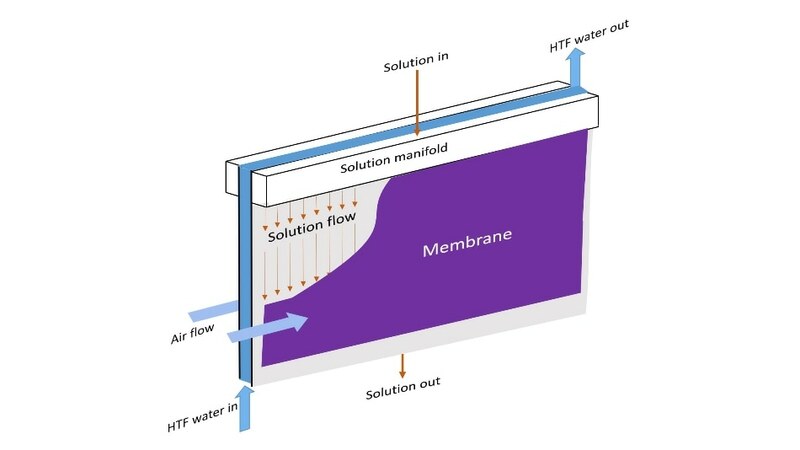 In the semi-open model, the conventional evaporator component has been replaced by a novel absorber device, which pulls water vapor straight from air into a liquid solution via a membrane. While the vapor is absorbed, most of the heat is moved to the domestic hot water. An affordable, non-sealed solution pump is used by the simple semi-open system, which functions at the surrounding atmospheric pressure. The system does not require the vacuum pumps present in the closed systems that remove gas build up. The system also enables manufactures to replace expensive and heavy metals used for building equipment, with lightweight, inexpensive polymers that are less likely to become corroded. The semi-open architecture introduces a new class of ultra-efficient heat pump water heaters that could become commercially available in a few years to homeowners seeking to replace their existing gas water heater. The development of a semi-open gas-fired heat pump prototype is led by UF scientists, who are experimenting at the UF facilities and ORNL’s DOE User facility, Building Technologies Research and Integration Center to determine the potential of commercial uses. Devesh Chugh and Saeed Maghaddam from UF and Omar Abdelaziz from ORNL have co-authored the research. DOE’s Building Technologies Office supported the endeavor. ORNL is managed by UT-Battelle for the DOE’s Office of Science. The Office is the largest supporter of basic physical sciences research in the U.S. It works to address many of the difficult challenges in today’s world.